The NYC bagel has been a breakfast go-to food seemingly forever, and for good reason. They taste terrific and are quick to prepare. Plus, they have about 10 grams of protein and a reasonable amount of iron which can be hard to find in other bread-like breakfast foods. But the typical plain bagel delivers 64 grams of carbohydrates and 6 grams of sugars, in 290 calories. Add a tablespoon of cream cheese, and you add a little more carbs (1.9 grams of sugars), 1.9 grams protein, and 84 calories. Is there a way to enjoy bagel-y goodness without carb overload? Absolutely! Grain-free, low-carb bagels exist, like the Everything Double Sided Bagelz by Vermont-based Fox Hill Kitchens. With only 10 grams of carbs and 7 grams of fiber, they add up to only 3 net carbs (total carbs -fiber) and no sugars. They also pack 9 grams of protein into 145 calories. They’re super keto-friendly, paleo-friendly and great for diabetics. You can add that same tablespoon of cream cheese or even a little bit more. Granola and milk is an all time fave and takes almost no time to prepare. The problem is, with 149 calories in a small one-third cup serving, granola also contains 26.5 grams of carbohydrates, 9.45 grams of which is sugars. And you only get 3.4 grams of protein from the granola itself. Skim milk will add 80 calories, 12.3 grams of carbs, 8 grams of protein, and 12 grams of sugar in the form of lactose. And who actually eats only 1/3 cup of cereal anyway? Fortunately, grain-free granola formulations are now available, like this coconut and cashew-based one from Purely Elizabeth. With no oats or grains, it’s a salty-sweet alternative to traditional granola, containing 5 grams of sugar, 9 grams of carbohydrates, and 5 grams of protein in a 170-calorie serving. One cup of unsweetened almond milk on top will only add 30 calories, less than a gram of total carbs, plus 1 gram of protein. Watch for high sugar content in nonfat yogurt. Greek nonfat yogurt comes in a variety of flavors, from a plethora of brands these days, but unfortunately fat-free usually means carb and sugar full. 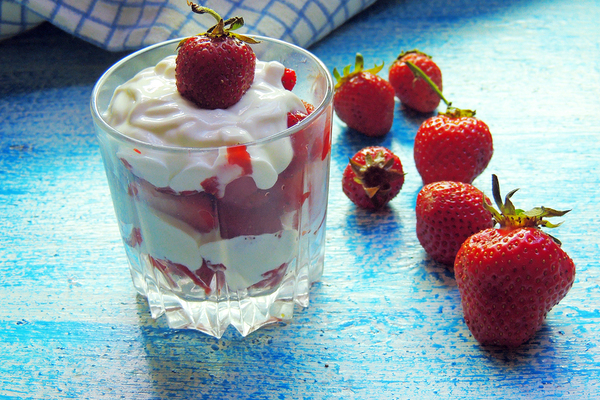 A 150-gram container of Dannon Oikos Strawberry nonfat Greek yogurt, has 110 calories, but with 14 grams of sugars, 15 grams of total carbohydrates. It contains a decent amount of protein (12 grams), but more sugar and carbs without any toppings added yet. Include 1/3 cup of regular granola and you’ve added another 26.5 grams of carbs, 9.5 grams of sugars, plus 149 calories. Instead choose plain nonfat or full fat yogurt and you’ll see a major drop in carbohydrates. One of my recommended brands is Siggi’s Icelandic yogurt. Their 5.3 oz plain non-fat yogurt has 100 calories, only 3 grams of sugars, 6 grams total carbohydrates, and 17 grams of protein. It’s the perfect base for creating a keto-friendly or low carb yogurt parfait. A half cup of strawberries only has about 25 calories and 6 grams of carbs. You can even add 1/3 cup of grain-free granola while only adding 9 grams of total carbs and 5 grams of sugars, along with 5 grams of protein. The following table sums up basic information on traditional breakfast foods and their low carb breakfast swaps. If you’re thinking about starting a low carb or ketogenic meal plan, but are concerned about missing your favorite high carb breakfasts, no need to fret. Try these low carb breakfast swaps, and you won’t miss your traditional breakfast foods and you’ll be fueling your body in a healthier manner.